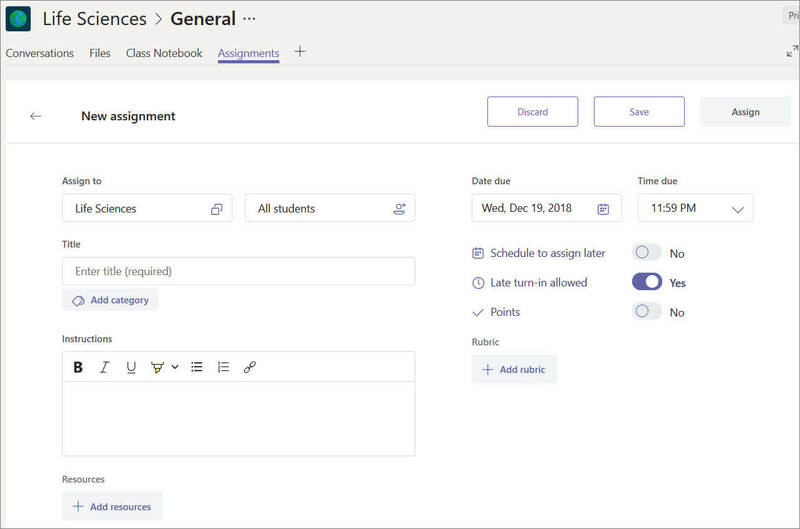 Create assignments for your students in Microsoft Teams. Manage due dates, instructions, adding resources to turn in, and more. Navigate to the General channel under the desired classroom, and then select Assignments. Select the Create button and select New Assignment from the dropdown menu. Enter a title for this assignment—this is required. Your title will appear on the assignment card in the weekly assignment view. Choose multiple classes or individual students in one class to assign to. Attach resources to the assignment by selecting +Add resources. During this step, add a document from your personal OneDrive, computer, or create a blank Word, Excel, or PowerPoint document to hand out to your students. Leave the default as Students edit their own copy to distribute an identical document to each student to edit and turn in. Choose Students can't edit if you'd like to attach a document for reference only, such as a PDF or link. Note: If you're assigning a Class Notebook page, check to see what version of OneNote your students are using to ensure that their assignment pages will lock after the assignment due date passes. Select late turn-in if you’ll allow students to turn in this assignment late. Select the amount of points this assignment is worth, if any. You can use points on any number-based scale including whole numbers of 100 and set your own denominator. Examples: 88/100 or decimals 3.7/4.0. Select Assign. Your students will be notified of the new assignment. A card will also appear in the Conversation tab of the General channel with the due date and a link to the assignment's details. Select Discard to discontinue work on this assignment or Save as draft to return to the assignment and edit it later. Note: Select the Expansion icon (diagonal, double sided arrow) to enter full-screen mode.